This Site Is Well And Truly Under Construction - Please Bear With Us Until The End Of The Month! Insomnia is no joke for millions of people. This page is your starting point for the biggest collection of detailed articles that will help you sleep better at night. Whether you are looking for the scientific explanation of sleeplessness – or just a quick fix that will get you back in the right routine - the SleepWellTimes has the information you need. While you enjoy the material here, remember that for the majority of people, insomnia is a transitory condition. Simple changes to your lifestyle, bedroom routine, diet or even how you think about sleep are usually all you need. The benefits of a healthy sleeping pattern will benefit you and all of those you love - making it worth the effort to get this area of your life working for you, rather than holding you back. Insomnia can range in severity and duration – its effects covering the spectrum from temporary fatigue through to a severe heath condition. Trouble getting to sleep happens to everyone at some point in their lives, thankfully this is usually temporary. When disruption to sleep, either in quality or quantity occurs, it is time to seek a cure. Fortunately, there is a lot of ongoing work to understand the causes of different types of insomnia. These range from the ‘hard science’ of brain chemistry, through psychological and environmental factors. Your insomniac symptoms can often be cured with simple behavior or diet changes. Failing that natural (herbal) treatments and conventional insonmia drugs have a good record of reducing the severity of disrupted sleep. Are These Insomnia Symptoms Caused By A Health Condition Or Medication? If the answer is 'yes' then the patient is categorized with 'Secondary Insomnia', in the absence of any external causes then the categorization is of 'Primary Insomnia'. How Long Have These Symptoms Lasted? Episodes of less than a week are termed 'Transient', those of up a month 'Acute' and over a month 'Chronic'. What Is The Main Sleep Disturbance The Patients Report? There are 3 broad categories here, the most common is 'Sleep Onset Insomnia' which is simply difficulty falling asleep. Next is problems involving the maintenance of sleep, which involves waking up in the night and not being able to sleep for a period of time. Finally, some people wake up earlier in the morning than they would like, again they are unable to return to sleep. (causes of insomnia graphic goes here). In each case of insomnia there are likely to be multiple causes – which interact with each other. For example, bed time snacking of the wrong foods might mix with some external night time noise, a little worry about work and even a subtle shift in the chemicals in your brain. You will find a detailed article covering the key causes of insomnia here – below is a summary of some of the most common categories of causes. #1 – Food And Drink: This ranges from caffeine and alcohol, through to carbs and sugar. What you eat and drink becomes more important as bed-time approaches. You can find a great list of healthy bad time snacks which will not affect your slumber in this article. #2 – Your Sleeping Environment: Noise and especially light can disrupt your ability to fall asleep (or wake you up far to early). There are many more factors besides – Do you have the right pillow? Is your partner restless (or even snoring! ), are you too hot or too cold? #3 – Brain Chemistry And Circadian Rhythms: Many factors can influence the amount of serotonin in your brain, including drug treatments for unrelated conditions. Also, your natural sleeping cycle can be offset by long distance travel (jet-lag) or you may just happen to have the kind of rhythm which makes you suited to later sleeping times than the pressure of modern life permits. #4 – Worry And Stress: Nothing stops me sleeping faster than a worry on my mind! This could be work-related, concern upcoming exams or just a complex family. What often happens is that a worry stops you sleeping, you use extra caffeine the next day or a quick glass of wine to help you relax – and a vicious circle of sleep disruption begins. #5 - Medication And Common Drugs: Both over the counter and prescription medicines can affect your sleep. You will also find that common recreational drugs have major effects on both sleeping quality and duration. How Do I Treat Insomnia Symptoms? First, you need to understand what is causing you to lose sleep, and the effect this is having on the duration and quality of your sleep time. There are various ways of doing this, ranging from an old fashioned sleeping diary through to the latest high-tech smartphone apps. For many of the causes of insomnia, the treatments are obvious. For example you might need thicker curtains to prevent the morning light triggering an unwanted wake-up response – or you might find that switching that afternoon coffee to a decaf solves the problem. 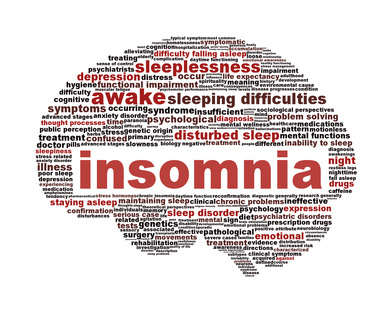 My detailed Insomnia treatments article summarizes the main treatments. You will also find detailed articles covering drug treatments, natural remedies and many other techniques including light therapy and psychological approaches. List Of Insomnia Treatments: This page covers treatments and cures for insomnia, and links to many specific treatment guides. Best Bedtime Snacks Guide: What you eat before bed makes a huge difference to your quality of sleep	-	safe	snacks here! I Can Not Sleep - Does This Mean I Have Insomnia? Not usually. As irritating as a sleepless night might be, insomnia occurs only when disruption is prolonged and starts to have an effect on your waking life. Everyone experiences times when they can’t fall asleep – my advice is not to label yourself as ‘insomniac’, as this can cause extra worry which might just affect your sleep! Sleeping disorders come in many forms, and as the research into the amazing world of sleep continues, new ones are being categorized and named all the time. The most common grouping is known as the 'parasonmias', which includes common complaints like sleepwalking, waking up confused or teeth grinding (known as Bruxism). You will also find categories of problems caused by movements, including restless leg syndrome. I have given snoring and apnea their own category page here at the SleepWellTimes, as these difficulties have causes and remedies all of their own. The articles below are ideal for those wanting to find out more about the different sleeping disorders - and of course the treatments and cures for them.